My customers love to buy stamp sets that coordinate with our punches. The Four Frame Stamp Set is so versatile, lending itself to many different looks. These two cards are so different, but were both created with this set. My friend had borrowed my set and I told her she had to make me at least one handmade card ( if you've been stamping for awhile you know the "rule"…borrow something and return it with something…lol). I was quite happy to receive these beautiful cards! 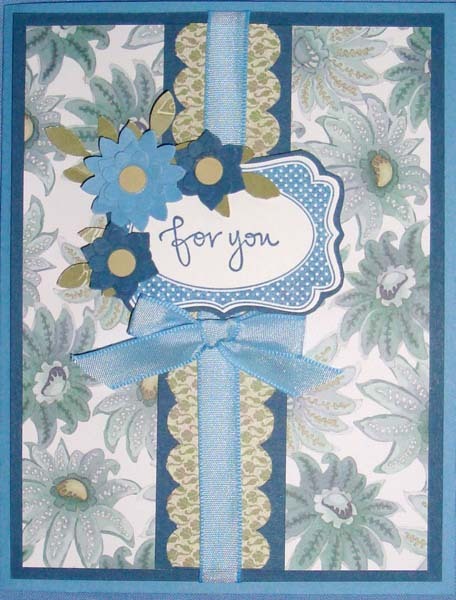 The sheet of Paisley Petals Designer Series Paper that she used on the second card is my favorite of that pack. The Marina Mist color coordinates so well with Not Quite Navy, and flowers punched with the Boho Blossoms Punch look great with this paper. If you've already purchased your set and paper, I'd love to see what you've created! If you've yet to participate in this April Special, check it out! Don’t Forget Spring Sneak Peek!